At Home Animal Hospital provides microchipping for cats and dogs in Maui so you can be sure that if your pet gets lost you’ll have support and the best chances of tracking and finding them. The main benefit of microchipping in cats and dogs is the increased probability of reunification of lost or stolen pets with their owners. According to AVMA, owners of microchipped cats and dogs have a 74% higher probability of finding their pets due to the presence of the microchip; purebred registered animals and spayed/neutered pets also have a higher probability of being found if lost. Microchips are tiny electronic chips that are housed inside of a small glass cylinder and are about the size of one small grain of rice. 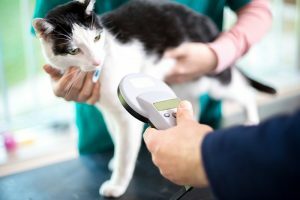 Microchips can be activated by special scanners that are found at most pet hospitals and veterinary facilities in Maui. Once the chip is registered, your pet’s information will show on a screen. In the case that your pet is lost, the animal shelter or veterinary clinic will inform the international database company and you will be contacted to pick up your loved one. Peace of Mind to You and Your Family! The benefits of microchipping for pets can be described in a single phrase: Peace of mind! Pet owners who get their dog or cat microchipped have peace of mind that in the event that they are separated from their pet, be it due to a disaster, an accidental open gate or theft, they will have the highest possible chance of having the pet quickly identified and returned to them. We recommend that owners always have identifying information on their pet’s collars. However, a tag or collar can easily fall off or be removed. If a pet is also microchipped, a pet owner can rest assured that they are taking the most precaution and giving their pet the best possible chances of staying safe and staying home. The microchips that we use at our veterinary clinic in Kahului are high-tech devices that work not only on Maui and the other Hawaiian islands but also internationally. This means that if you travel with your pet outside of Maui or you move away from the island the microchip will keep on working. The dog and cat microchipping processes are very fast and require only a hypodermic needle. The microchip is delivered directly into the pet’s skin in seconds. Pets don’t feel any more discomfort than they would during a standard injection, such as a rabies shot. To ensure no discomfort at all, some pet owners choose to have the microchip inserted while their pet is already under general anesthesia for another procedure (a spay or neuter surgery, for example). 1. Register the microchip so that it is associated with your pet and you can be contacted in the event that your animal is lost. 2. Bring your pet to our Kahului vet clinic for their yearly pet regular exam and one of our veterinarians will scan the microchip. This way we can be certain that the microchip is functioning and can be detected. 3. Keep your registration information up to date. If you move away from Maui with your pet, or if your phone number or email change, make sure to go to the microchip manufacturer’s database to update your information as soon as possible. If you have any questions about our services, please contact us today at (808) 873-0102.